How would you spend your perfect California day? Let Vantigo charter services make that dream a reality. Our exclusive Charters service the San Francisco Bay Area. In San Francisco we have two fully restored 1971 Volkswagen Van’s that hold up to 14 people total and are available for weddings, parties, and more fun times. An intimate and personalized experience from ceremony to reception. You may be old, but so is our vintage fleet of restored Volkswagens! Our beautiful buses are available for photography, movie shoots, commercials and production. Great for any occasion you’re celebrating. 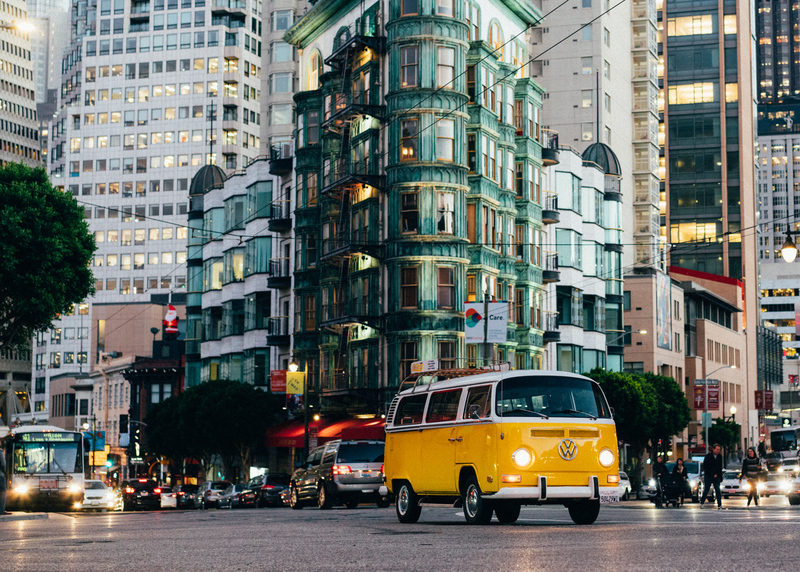 Our exclusive VW van charters travel within 50 miles of our San Francisco garage. One of Vantigo’s experienced drivers will help you plan a truly a one-of-a-kind adventure. Free pickup and drop-off — Each location must be within 20 miles of Vantigo's San Francisco Garage. Absolutely no charge for fuel and bridge tolls. We have a five-hour minimum on all of our packages. If your pickup and drop-off locations are further than 20 miles from our garage, we charge just $1 per extra mile. Team bonding is important to the success of any company. Whether you are looking to facilitate bonding with a new team, reward an existing team for their hard work, or showing off the Bay Area to an out of town branch, Vantigo has you covered. For groups of 7 or fewer, you’ll be all set with one of our vintage VW vans. If you are planning for a team of more than 8 people we can offer you use of a combination of our two VW vans. Have a group larger than 14? Get in touch and we’ll let you know your options!